WASHINGTON — Black social media users are nearly twice as likely to see posts about race and race relations as whites, according to a report released Monday by the Pew Research Center. According to a survey of more than 2,000 social media users, 65 percent of black users say that they encounter posts about race or race relations whereas 35 percent of their white counterparts say the same. From the same survey, 28 percent of blacks say that most or some of what they post to social media is about race or race relations while 8 percent of whites say they post on the same subject. "It is clear by now that people's use of social media adds many voices and often new perspectives to the understanding of public events. Social media campaigns can also at times drive up the amount of attention that people give to some issues," Monica Anderson, research associate at Pew Research Center, said. 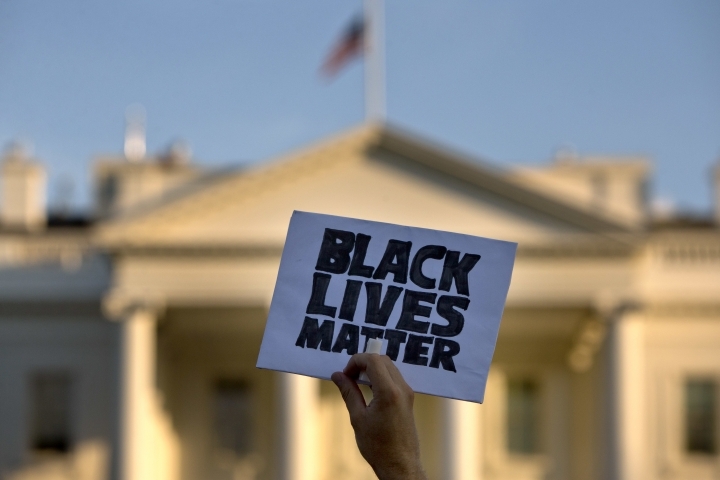 "The rise of race-related hashtags and campaigns on social media is a prime example of that." Pew researchers also observed Twitter hashtag trends following the shooting deaths of two black men, Philando Castile and Alton Sterling, by police, and found that the hashtag #BlackLivesMatter was used nearly 5 million times on July 5-7. Of those, 87 percent were in support of the movement and 11 percent in opposition. However, the trends changed following the shooting of five police officers in Dallas on July 7. From July 8-17, 39 percent of tweets containing #BlackLivesMatter were opposed to the movement, 28 percent were in support and researchers deemed 33 percent neutral. Tweets opposing the movement continued to grow after violence against police in Baton Rouge, Louisiana, Pew researchers said. The day after the attack, only 26 percent of tweets with #BlackLivesMatter were in favor of the movement and 67 percent were opposed. Over the 12-day period as a whole, Tweets including #BlackLivesMatter were narrowly positive with 41 percent in favor of the movement and 33 percent critical. Pew sorted #BlackLivesMatter hashtag into Tweets that either supported the movement, were opposed or were neutral. If the researchers disagreed about the context of a Tweet, it was discarded from the count. Social media user statistics come from a Pew phone survey of 2,335 adult social media users 18 or older in the U.S., from February 29 to May 8. The margin of error was plus or minus 2.3 percentage points.